SBS Transit Bus Service 860 is a trunk route from Yishun Temporary Interchange and looping at Yio Chu Kang Bus Interchange, passing through Yishun Avenue 9, Yishun Ring Road, Upper Thomson Road and Ang Mo Kio Ave 5. It was the very first service to be introduced under the Bus Service Enhancement Programme, or BSEP, linking the eastern sections of Yishun Ring Road with Khatib and Yishun MRT stations, before being extended to loop at Yio Chu Kang in October 2017. 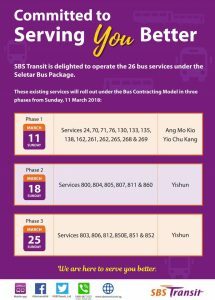 SBS Transit has taken over operations of Bus Service 860 from 18 March 2018 as part of the Seletar Bus Package. 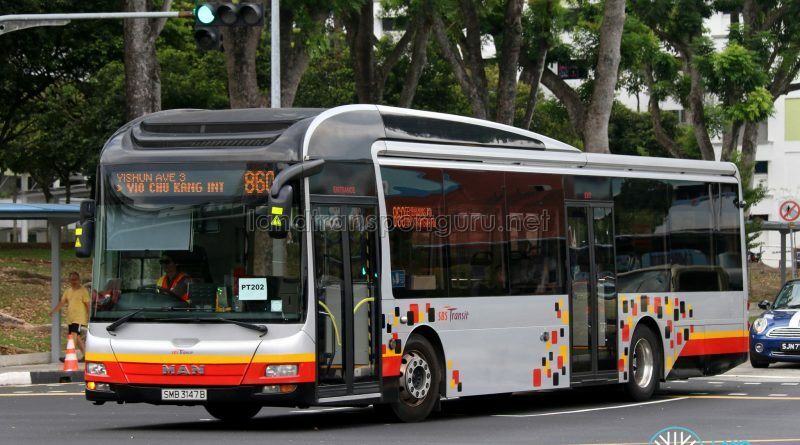 Service 860 is a residential trunk route serving within the housing estates of Yishun, connecting housing blocks, schools and public amenities along Yishun Ave 9, Yishun Ring Road and Yishun Ave 3 with connections to key transport nodes at Khatib MRT, and Yishun Bus Interchange & MRT. The route serves schools such as Yishun Town Secondary, North View Secondary and Naval Base Secondary, and community amenities such as Nee Soon East Community Centre and Yishun Swimming Complex. 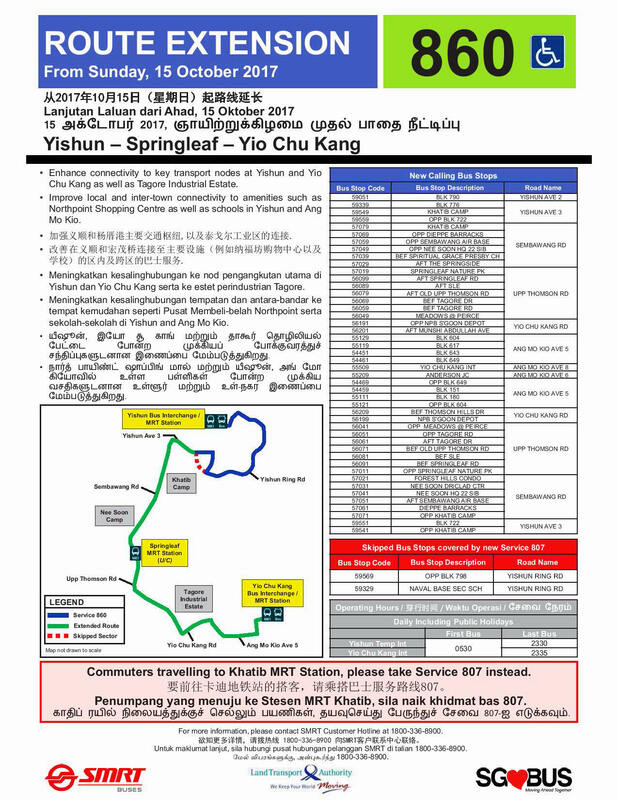 On Sunday, 15 October 2017, Service 860 was extended to Yio Chu Kang via Springleaf and Tagore Industrial Estate, to improve local and inter-town connectivity between Ang Mo Kio and Yishun. The extended Service 860 operated daily (including public holidays) from 5.30am to 11.30pm from Yishun Bus Interchange, and from 5.30am to 11.35pm from Yio Chu Kang Bus Interchange. Short-Trip Bus Service 860A was also withdrawn. Commuters from Yishun Ave 9 & Yishun Ring Rd heading to and from Khatib MRT Station should take Bus Service 807 instead. Introduced on 21 Oct 2012, the route is the very first service to be introduced under the Bus Service Enhancement Programme or BSEP. The route compliments Service 804, which frequently occurs overcrowding and does not provide links to Khatib MRT. 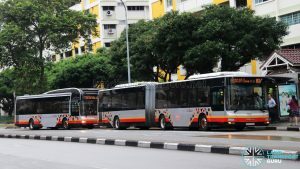 Service 860 also enhances connectivity for residents of Yishun Ring Road. 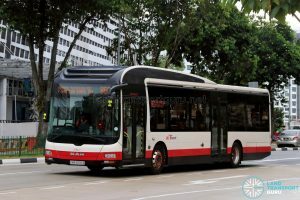 The service benefited from a capacity upgrade in late April 2015, when SMRT arranged for a Mercedes-Benz O405G articulated bus to perform several round trips during the Weekday morning peak, going against LTA’s regulations of deploying non-BSEP buses on BSEP bus services. However, Member of Parliament Dr Lee Bee Wah saw this arrangement as a permanent fixture and commended LTA for the “fleet improvement” for Service 860. 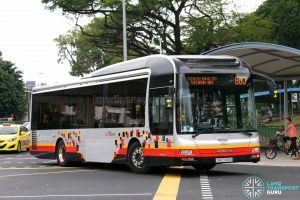 Since the bus depot handling Service 860 (Ang Mo Kio Depot) could not accommodate double-decker buses back then, negotiations between LTA and SMRT Buses allowed for a permanent articulated bus crossover from Service 854 during the morning peak hours. This is the first known exception to the BSEP bus deployment regulation set by LTA. 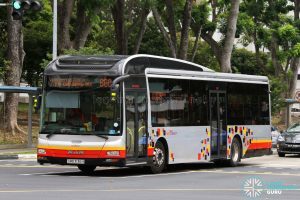 The service received yet another fleet enhancement with a MAN A24 articulated bus being deployed on a daily basis on Service 860 from 15 November 2015. Member of Parliament for Nee Soon GRC Mr Louis Ng joined Minister Ong Ye Kung along with SMRT Staff for “Launch of the bendy bus for Service 860”. 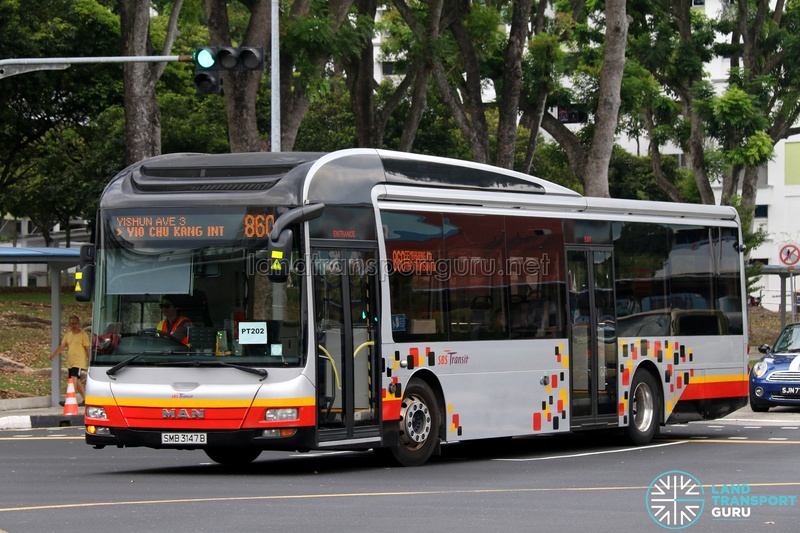 However, this was not the debut of regular bendy bus arrangements (see above), but rather, a dedicated high-capacity articulated bus for Service 860. 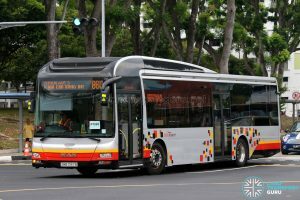 On 12 January 2017, Double-Decker buses made their debut on Bus Service 860 as well as Shortworking Trip 860A, catering to exceptionally high demand along Yishun Ring Road. Fare: Charges basic fares. See Bus Fares. 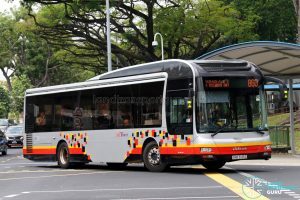 Calculate your bus fare using LTA’s fare calculator on MyTransport.sg here. The Bus Service Operating License (BSOL) for this route will be renewed in 2023 under the Seletar Bus Package. 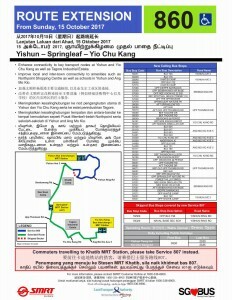 2012 (21 Oct): introduced from Yishun to Yishun Ring Rd (Loop), via Yishun Ave 9, Yishun Ring Rd, Yishun Ave 3, Yishun Ave 2, Yishun Ring Rd, Yishun Ave 9, Yishun Ctrl & Yishun Ave 2. This bus service is under Bus Service Enhancement Programme (BSEP). 2015 (25 May): Shortworking trip 860A introduced during weekday morning peak hours. 2017 (15 Oct): Extended to Yio Chu Kang Int. Skips Khatib MRT Station. Short Trip Service 860A withdrawn. 2017: Extended to Yio Chu Kang Int. The bus is driving at extremely slow pace and stopping at every stop when there are no passengers. It’s definitely frustrating when it comes to peak hours when everyone is rushing for work and the bus captain needs to drag the bus to meet the timing and waste commuters time. Can the bus just drive at a normal pace? Why does Bus 860 travel so slowly? It move like a tortoise crawling. The driver will stop at every bus stop even there is no passenger alighting or boarding. It took 40 mins from Khatib camp to Yio Chu Kang Interchange. At first i am very happy that there is a straight bus from Khatib to YCK interchange but it is so disappointed. The scheduled running time for this bus service is excessive, resulting in Bus Captains driving at a very slow speed. Given that 807 will replicate the Yishun Ring Road portion and that 860 will no longer call Khatib MRT, I do not quite understand why the new routing still needs to go through Yishun Ring Road. Would it be better to go via Yishun Central? That way, it will connect Springleaf/Teacher’s Estate directly to KTPH. An essential link for Yishun Ring Rd neighbourhood 3 & 4 where bus services were seriously lacking. Thanks to BSEP which brought in new routes like 103(extended), 663, 803 & 805. Look forward to more trunk route additions with the completion of several flats at St 51 and Ave 4 which will further increase 860’s current high loading. Planners may consider diversion of existing routes from main road.